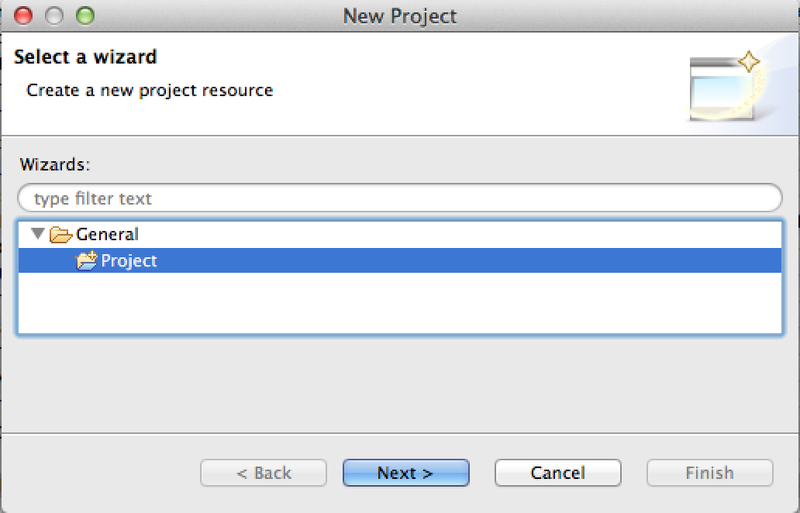 Before you can start automapping, you have to create a project and import your file (e.g. 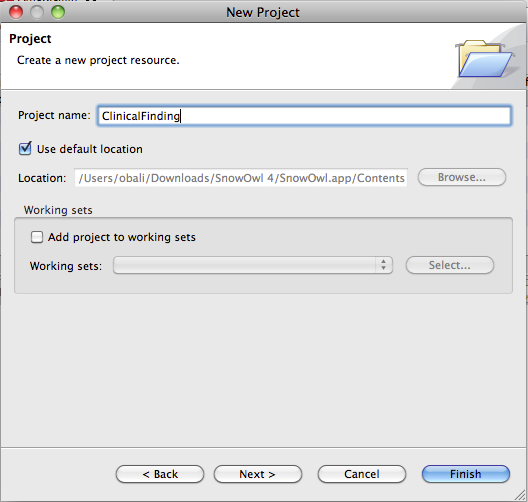 a comma separated value or Excel file) into Snow Owl. 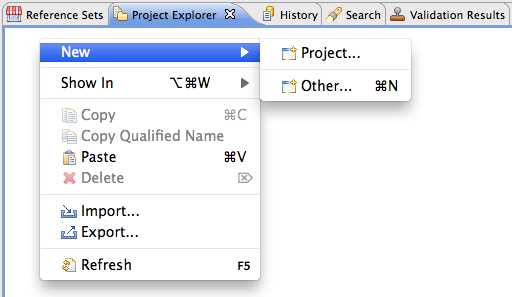 Go to the Project Explorer view, right-click and select New > Project from the context menu. On the first page of the wizard, select General > Project, click Next to proceed. Enter your project name, click "Finish" to complete the process. Your new project folder can now be found in the Project Explorer View. If you right-click this folder, you have to option to chose different types of files from the context menu. For automapping, you will need a New reference set automapping file..
Spreadsheets from comma separated value (csv) and Microsoft Excel formats (xls and xlsx) can be imported into the workspace to support automapping with external codesystems and terminologies. To import a spreadsheet, right-click on a project folder in the project explorer and select New reference set automapping file.. from the context menu. Alternatively, you can invoke the wizard from the main menu: File > New > Snow Owl > Reference Set Automapping File (see screenshot). If you chose this option, you will have to specify the folder. Use the browse button to select the source file (e.g. your Excel spreadsheet). If your spreadsheet does not have headers or empty lines, uncheck the boxes. 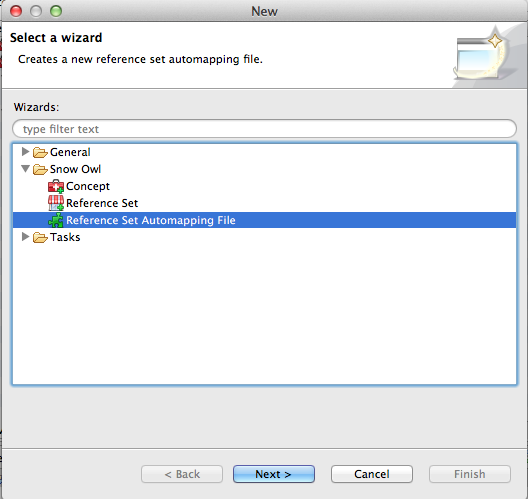 Automapping supports the creation of both simple type and complex type mapping reference set. 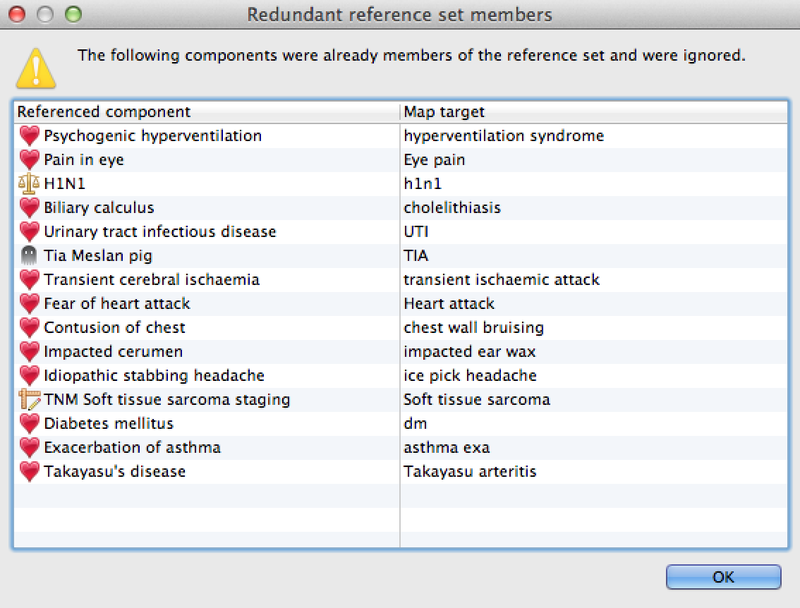 The target reference set has to be specified at the spreadsheet import. 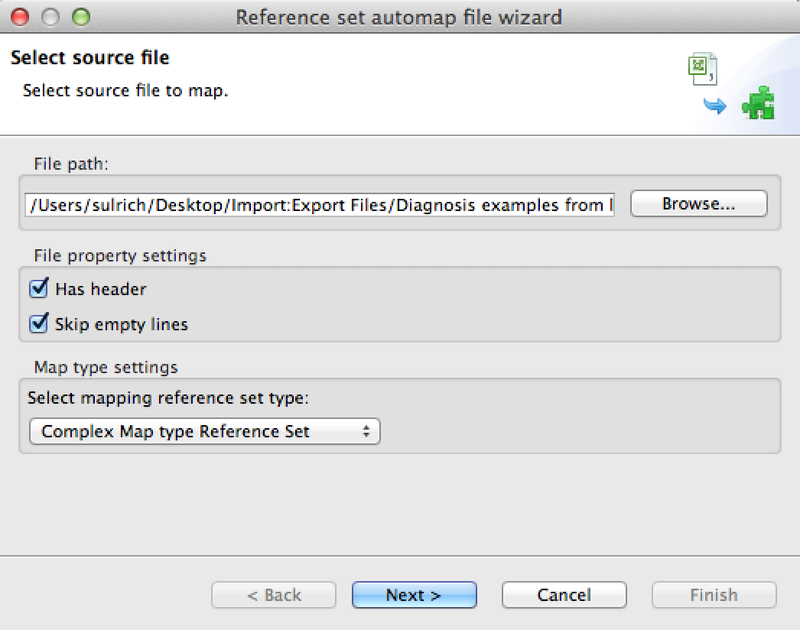 By default, a complex map type reference set is created, but you can also select a simple map as a reference set type. Hit Next to proceed. Specify which column of the spreadsheet contains the IDs (codes), and which one the labels (terms). The header of your spreadsheet will be displayed in the drop-down menu (e.g. "Medical term"). By default, the first column is used for IDs, and the second one for labels. If your spreadsheet has a different header configuration, you have to use the drop-down menu to adjust the settings. Hit Next to proceed. Enter the name for your automapping file. If you started the wizard from the main menu, you fill also have to select a project folder. Click Finish to close the wizard. Your new automap file is now displayed in the project explorer. When importing a new version of a spreadsheet, it can be compared to a previous version. Changes or new items will be listed in the wizard. The new feature can be invoked by clicking Open import and compare with file dialog in the toolbar of the automap editor. Select the automap file (version 1) in the Project Explorer, and double-click it to open the automap editor. Click the compare button in the toolbar to invoke the wizard. Select the new version (version 2) of the spreadsheet that you want to import. Click Next. Now you can review a list of differences between the two versions. Select the ones you want to import by checking the boxes, and click Finish. The automap file has been updated with the new version. You can see that the newly imported items have not been mapped yet. Save the file, and click automap to map the new items. Double-click an automapping file to open the Automapping editor. 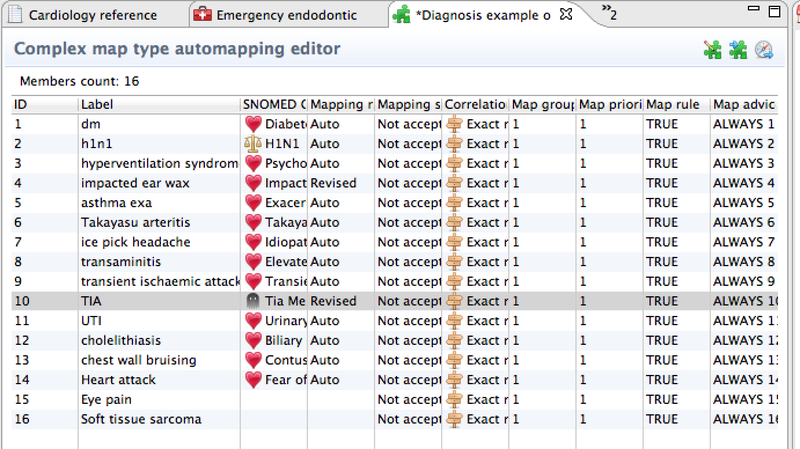 The layout of the Automapping editor is similar to a spreadsheet: ID codes are displayed in the ID column, clinical terms in the Label column. The column titles in your spreadsheet will be automatically used. 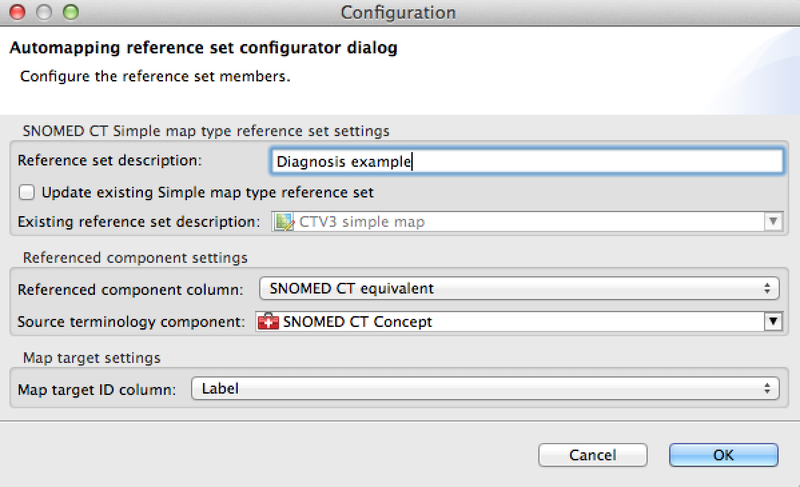 The SNOMED CT equivalent column and the Mapping mode column are empty, because the clinical terms haven't been mapped yet. Click on the button to invoke the automapping configurator dialog. 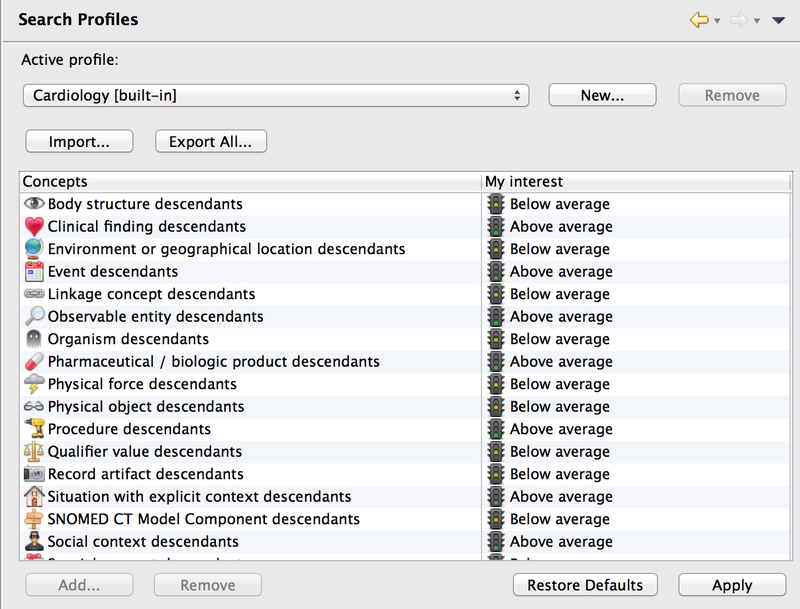 Top level concept: You can decide whether the entire terminology or just a certain top-level hierarchy (e.g. Clinical findings) should be queried to find the SNOMED CT equivalent concepts. Press OK to start the automapping. Now Snow Owl performs a lexical search for each of the labels from the external terminology. The automap feature is based on frequency of usage and your search profile. It works similar to the quick search, the first term that would appear in the quick search list is the one that is used for automapping. 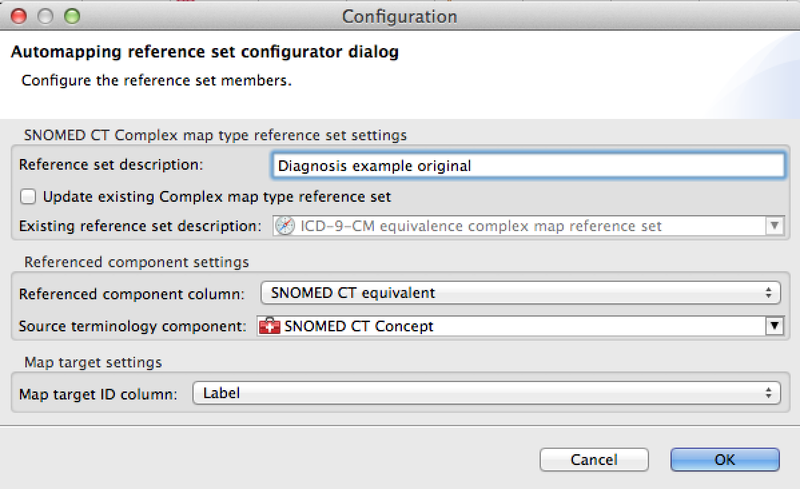 SNOMED CT equivalent : When an exact match has been found for an active concept, the SNOMED CT concept is inserted in this column. For those items that do not have a matching map source, the cell is empty. The mapping has to be selected manually.
''' Mapping state''' indicates if the mapping has been accepted to be moved to a complex map reference set. The additional complex map values can be used to further specify the type of generalization, and add map rules and advices that later appear in the Complex map type reference set too. Note: Since the automap feature uses the active search profile, you can change your profile to identify more relevant suggested mappings. For example, if you're mapping an in-house list of cardiology codes, you can activate the built-in Cardiology search profile (Preferences > Snow Owl > Search Profiles > Cardiology) to increase the relevancy of the matched terms. For more information please refer to the section about the Search Profile. When automatic mapping fails to locate a match, the manual mapping will display approximate matches for you to choose from. You can also use this function to change the mapping of an item. Simply click on the cell to bring up the quick search. Or you can accept multiple mapping at once. Mark the mappings you want to accept, you can select multiple rows that are not adjacent, or a sequence of adjacent rows (see screenshot below). Once you are done right-click and choose Approve mapping state(s). The change will be indicated in the column "Mapping state" which will switch from "not accepted" to "accepted". 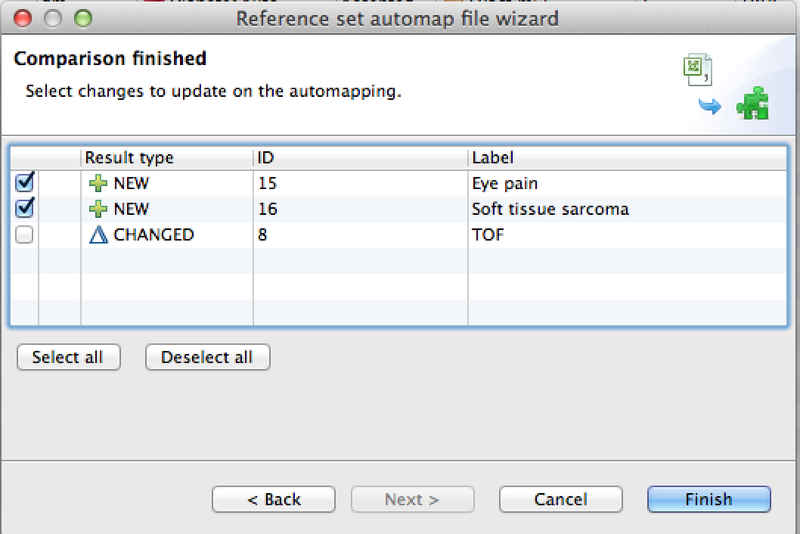 Note: When generating the Simple map type reference set only the "Accepted" maps are included. The automap file can be further edited. For example, the type of individual mapping (generalization, specialization, equivalence, etc.) using the IHTSDO standard method can be specified. Also correlation identifier concept can be added to the maps. Besides correlation, terminology specific map rules and advices can also be specified for the mappings. 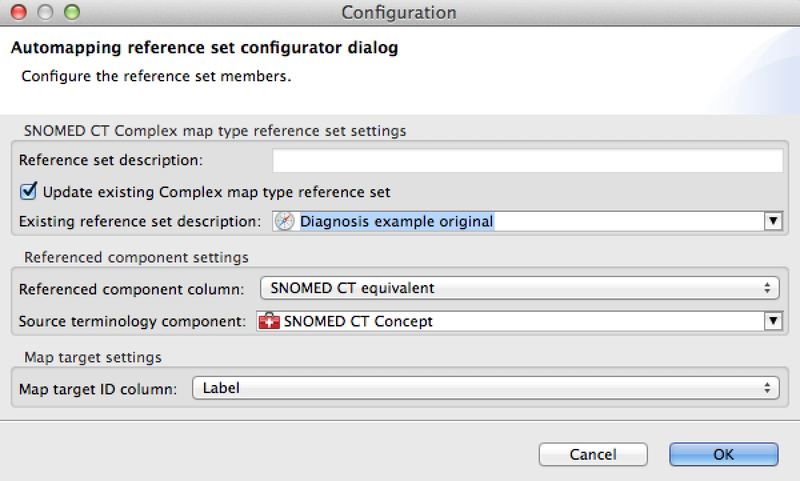 Snow Owl now transforms automap files into SNOMED CT complex maps, which allows specifying the type of each individual mapping (generalization, specialization, equivalence, etc.) using the IHTSDO standard method. It also allows adding a correlation identifier concept to the maps. Besides correlation, terminology specific map rules and advices can also be specified for the mappings. 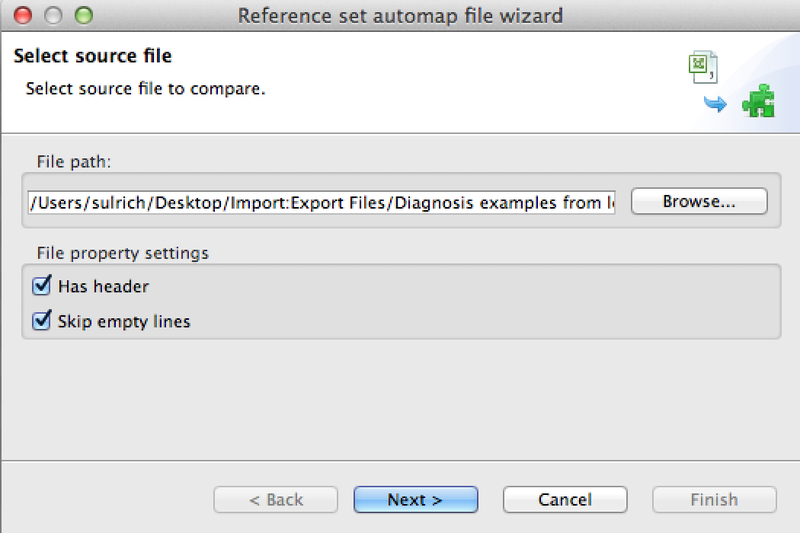 To generate a complex map type reference set from your automap file, click the compass icon in the editor. Update existing complex type map reference set: If you already generated a reference set from a previous version of the automap file, you can update the existing reference set. Map target can be selected to be either the code or the label of the external terminology. Enter a file path description in the dialog, add a commit comment and hit OK. The new reference set file will be displayed in the reference set view as a complex map type reference set. 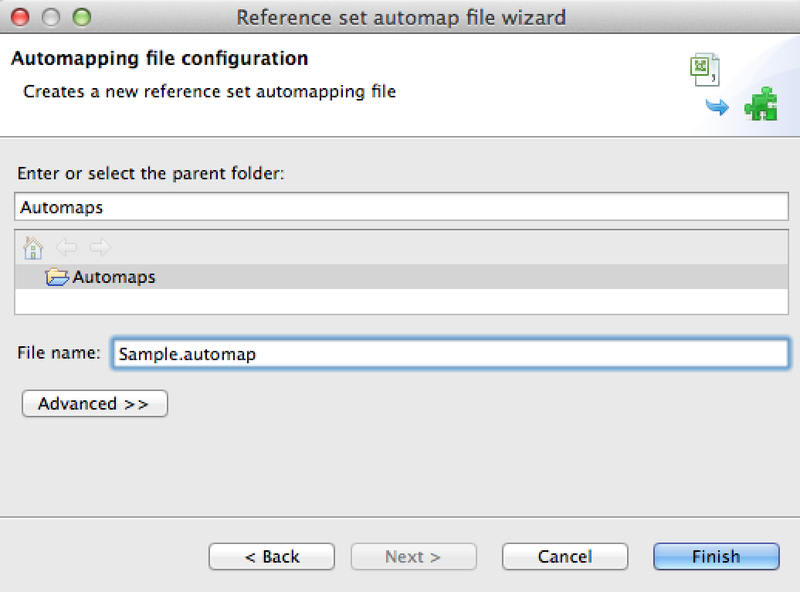 Creating a simple map type reference set from an automap file is similar to the process described for complex map type reference sets. If you have simple map, a map icon will be displayed in the toolbar allowing you to generate a simple map type reference set. The new map type reference set can be opened from the reference set view. When you made changes to an automap file, for example by importing a newer version of a spreadsheet, you can easily update the corresponding reference set. During the update new members will be added to the reference set. Members that are not present in the new version of the automap file are not removed from the reference set - this enables collaborative update of the same reference set from different sources. If the label changes (ID remains the same), the old mapping is inactivated (deleted) and a new one is created. Open the updated automap file in the editor. Make sure that you approved the mappings. Click the button in the editor's toolbar to''' invoke the wizard'''. 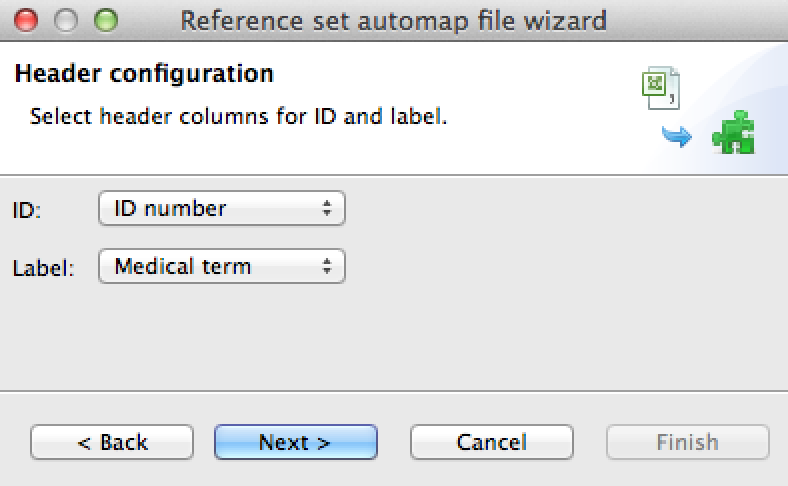 If you have a simple map type automap file, there will be a map icon to invoke the wizard. Check "Update existing complex type map reference set"
Existing reference set description: Select the reference set that you want to update from the drop-down menu. Map target ID column: Make sure this column corresponds with your selection in the previous reference set. Click OK to start the update. A dialog informs you about redundant members that were ignored at the update. These are the members that did not change. Click OK to complete the update.